Have you heard of this ever??? Well, you can burn calorie everywhere you wish. But in this post we are concentrating only on beach. We all go to beach some or the other time to get tanned, have fun, enjoy and what more. But during this time we tend to consume a lot of drinks and unprocessed sugars. So, now after all vacations it’s time to head back home. But you are all bloated and you have gained some weight. Let’s try out some methods to cut down your calories on beach. Swimming – what you do at a beach?? You swim. So, swim a bit more. Swim with a greater pace. 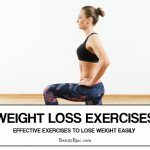 And you will reduce all the extra or recently gained weight in no time. 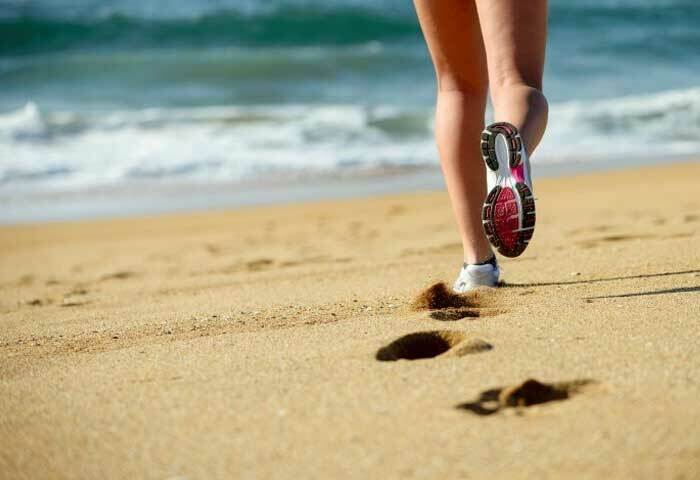 Jogging – there is nothing like jogging on a beach. So go ahead and inhale some fresh beach air. Fill your lungs with them and gradually you will be able to burn calories too. Skipping – the thought of skipping on a beach gives me goose bumps. Just imagine you are skipping with a light rope in the beach and winds touching your face and encouraging you to go ahead. Walking – you will never get a better place to walk than beaches. Walk with bare feet. Enjoy nature to the fullest till you are there. And gradually you will loose weight you can see and feel. Ditch those Sugar Drinks – sugar is always a strict no no if you want to reduce weight. So say no to sugar aerated drinks. This will do nothing for your health other than worsening it a bit more. Drink Coconut Water – you will get this in loads on beaches. Drink those. It is good for your skin and health both. it will reduce your bloatiness and flush away your toxins. Tennis – Have you ever played tennis on beach. Try it this time. you might end up loving this. And you will be happily amazed to see the amount of calories taht you have burnt meanwhile. Cycling – i love cycling on beach. You will require a lot of strength in this. The wind will blow against you making you use more strength and pressure. Thus, you will ne dup loosing more calories. Volleyball – Play volleyball on beach. The speed , agility will drive you mad. It will effectively tone your arms and legs. Also, your eye coordination will also improve in long term. Play Frisbees – Yes, playing Frisbees can make you loose weight too. You will jump, change direction, run with Frisbees. You might end up loosing a good 300-350 calories in this. Build a Sandcastle – who doesn’t like building sandcastle??? Well, then do it. This time both for fun and health. You will not realise it but building sandcastle also burns your calories. You will make efforts in maintain and building the castle. You will move again and again to prevent it from breaking. Do Yoga – YOGA is said to be like mediation. And what better place you will get than a beach. Practice and try as many poses as you want. Your health will considerably improve any breathing in fresh air and more by burning extra pounds. Jumping Waves – waves are quite high in energy. So, jumping against or in waves requires you to put in much more energy and strength. This is known to burn 400-450 calories per hour. Fishing – who doesn’t go for fishing in beaches? If you don’t you must start going immediately. Nor only this sea fishes are extremely tasty and healthy. But fishing as an activity involves a lot of energy and enthusiasm. Boogie Boarding – It is quite simple and common on beaches. You don’t need much skill and expertise in this. And it tones your entire body very much like swimming and cycling. It is known to burn 300-350 calories per hour. Ocean Kayaking – This is really a fun and daring exercise. Paddling in ocean with both your arms open. Isn’t it lovely??? But it is not as easy as it looks. It requires a lot of agility, strength and energy. You are expected to burn at least 175-190 calories in this activity per hour. Surfing – beach surfing is just fun. But it involves a lot of presence of mind, agility, strength and physical and mental presence. It’s not that easy as it seems. But if you do it diligently you might end up burning 200-250 calories per hour. Dancing – beach dancing is fun. Remember Jacqueline’s dance in Roy movie??? You can do the same. You need to put immense amount of energy in it and that makes it more challenging. You will lose at least 300 calories in this per hour. Guitar Class – do you know to play Guitar??? Well, if you don’t here is the chance to learn. And if you know then flaunt it there. Nor only it will enjoy and enthral people around but you might end up burning 250 calories per hour. Zumba Class – by now you are definitely aware of zumba classes. This is specially choreographed dance sequence which targets your entire body. They tone your body down and if done under expert advice it will burn atleadt 500 calories per hour. Biking – another wonderful thing to do at beach. Just take your friend behind you or start enjoying the wind alone. You will burn at least 50 calories in just 7 minutes. Catch Catch – catch makes you move very swiftly. You run and fall in all directions. This can burn at least 60 calories in just 20 minutes. Play Cricket – everybody loves cricket. So, why not play it on beach. You might end up losing a good 200 calories per hour. Horse Back Riding – this is another great way. Just do some horse riding and burn 300 calories with a mere one and a half hour ride. Stretching Exercise – take a mat and stretch yourself a bit on beach. You will burn 200 calories in every half hour. Aerobics – time to put those headphone plugs on your ears. And what should you do. Perform some exercises. You can burn 100 calories every half an hour. Perform Kickboxing – kick some good puches on beach. With the immense amount of strength and swiftness burn 200 calories per hour in it. So, i hope you have got by now what you are going to do on your next beach vacation. 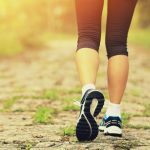 Burn 200 Calories in 30 Minutes by Walking!